Newcastle’s former military barracks are located in the heart of the city at the Newcastle Government Domain (James Fletcher Hospital). The military use at the Domain is not in public memory because it occurred so long ago. However I am very excited to share this story of a place that most people think of as ‘Watt Street’, a mental hospital. The complex was completed in 1842 and although only used in this capacity for a decade the site has provided good public infrastructure to 2014. The original military infrastructure remains and the buildings and parade ground relatively well cared for by NSW health authorities since 1871. As a military complex the Newcastle site has significance because it was formed at a time when British authorities were responsible for defence in NSW. When they left the site in the early 1850s it fell to the people of NSW to form their own military force. This volunteer force are shown in photographs of the site during 1850s to 1870s. The National Archives, UK have permitted archival sources associated with the Newcastle Barracks to be shared, finally unlocking our history. The Newcastle Government Domain had been the official space of the penal settlement and later the military barracks used exclusively by the Imperial authorities in setting up the military complex. 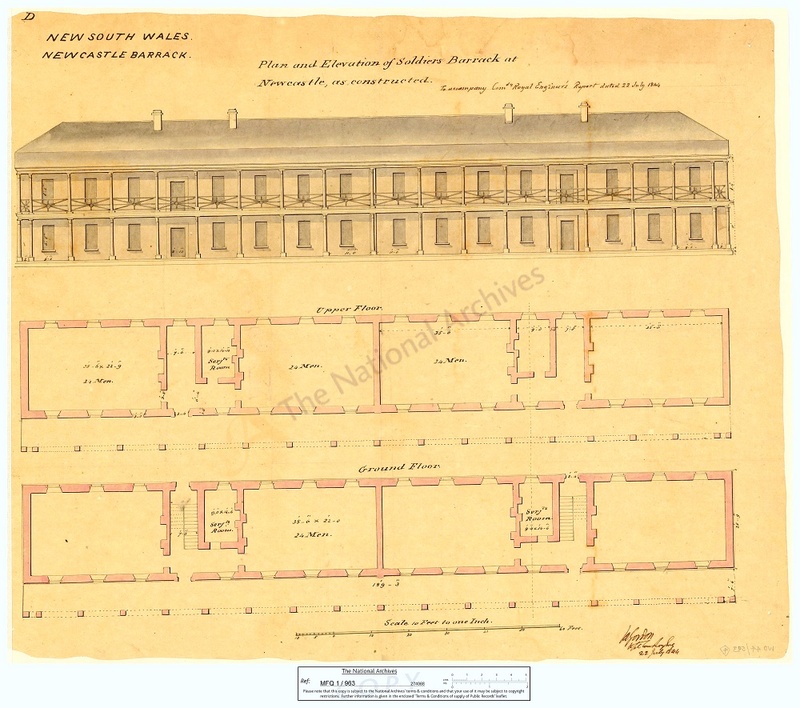 The construction of the barracks at Newcastle was well planned and strategically placed there with the use of the Domain by British troops as the only well planned use of the site; all of the other uses were more haphazard. The Domain’s use as a military site ensured a military presence at the ‘coal emporium’ of the colony. There was never any real idea as to how long the colony would require the support of British forces. However the colonial Government would take over the Domain when there was no longer a need for Imperial forces in the colony. The military barracks had not been deliberately built to be handed over to the colonial government for its new defence role; particularly so soon after they had been erected. The Victoria Barracks in Sydney which were established in 1848 and erected under similar circumstances to the Newcastle barracks (under the supervision of Colonel Barney) is still home to the Australian Army and has remained in continuous military use to 2014. The Barracks at Newcastle so lately completed at an expense of 20,000 Pounds…is situated at the mouth of the River Hunter, which runs thro’ the richest part of the Colony…besides Newcastle is the richest emporium of coal in this Colony, and a Military force will be always be required there. 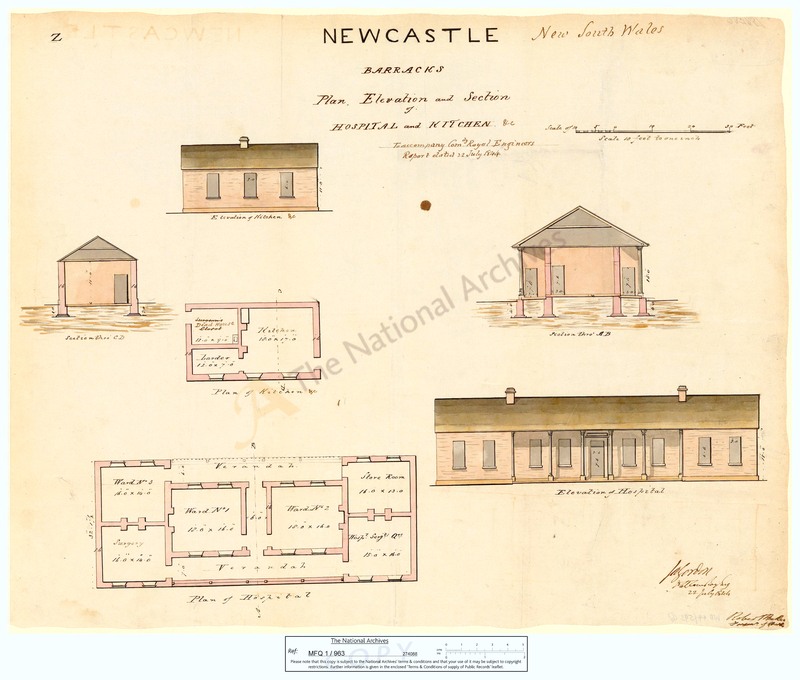 A significant building programme saw a military barracks in Newcastle constructed in the 1840s. These buildings were designed, constructed and maintained by the Imperial authorities for the use of troops stationed in Newcastle to protect coal mining and coal ready for shipment. As such, the troops’ presence supported the growth of infrastructure and commerce in Newcastle, ensuring that the Macquarie Pier would be completed to provide a safe harbour for the export of coal. Running between the southern mainland at the foot of Signal Hill and Nobbys Island, the pier (now known as Nobbys Breakwater) was designed to improve access to the harbour by directing all of the water flow through the main channel to the north of Nobbys. Although the military withdrew in 1851, the buildings constructed for them provided the infrastructure that would secure government occupation of the site to 2014. From the Domain the colony’s wealth and the ‘richest emporium’ of coal were to be protected. Convict labour was used to prepare the military site for the building works. A chain gang quarried the site to level the ground to allow for the erection of rectangular military barracks and a parade ground. The sandstone wall on the south boundary of the Domain was built using convict labour and is an extention of the excavated quarried rock forming the rest of the southern curtilage. The establishment of the military barracks at the Newcastle Domain offered security for local industry and economic development. The military buildings created new government infrastructure into the future. There were two main uses during the 1840s to the 1860s, firstly a military headquarters and secondly, for offices of public servants. The community also began to use the Domain in the 1850s when the volunteer forces trained there. Events related to the Newcastle Government Domain from 1841 to 1871. Until the 1850s most of the workers at Newcastle were former convicts, free miners, Aboriginal people and sailors. Convict workers also prepared the foundations of the Soldier’s Barracks and Officer’s Quarters. The design of the military buildings was a standard plan that could be applied anywhere in the empire. It was not specifically drawn up for the Newcastle Domain. The plans were prepared in England and their implementation overseen in NSW by the Royal Engineer Henry William Lugard. Some of the site plans for the barracks are held in the United Kingdom Archives, Kew and show the layout of the buildings but none of the original architectural plans survive. The construction of buildings was undertaken by contractors Hudson and Richardson from Sydney. Some adaptations were made to suit the location. For example, windows were placed opposite one another in the Soldier’s Barracks to take advantage of the free air flow from the Pacific Ocean. Other environmental factors were also taken into account such as the construction of a long veranda on the eastern side to shelter the adjoining rooms from the sun. It took until 1841 for the military complex at the Domain to become fully operational. At the new barracks in 1844 were two field officers, ten officers, two hundred non-commissioned officers and privates and sixteen horses. As well as providing general security, their expertise in engineering was crucial in building essential infrastructure as well as overseeing the structural work at the Macquarie pier. Just as the Government House site had been chosen for its position overlooking the settlement, the military were able to keep watch over the port and local works from the Domain. Figure 2- Former Military Hospital Source: Ann Hardy, 2013. This contemporary photograph of the Former Military Hospital shows that little has changed of the building. 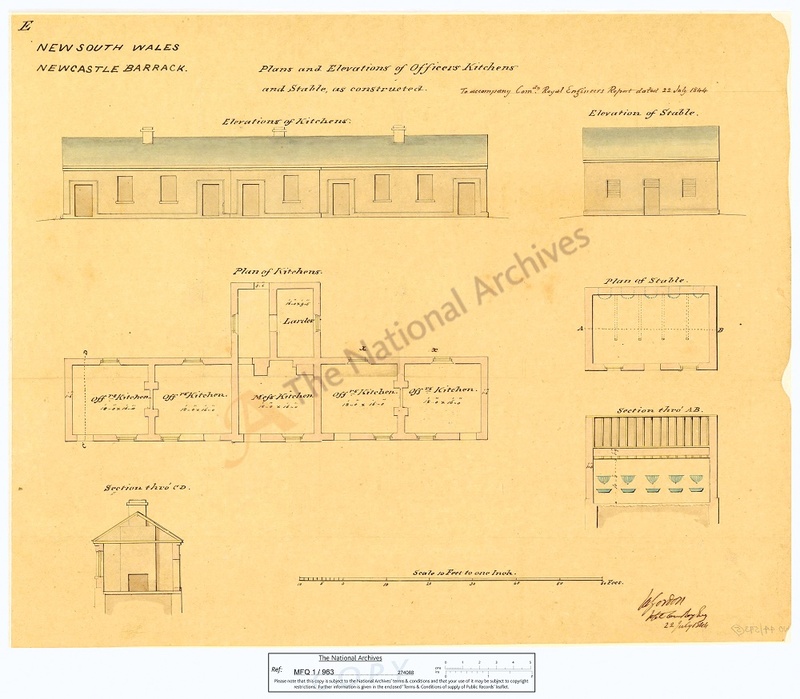 Figure 1 shows a plan developed by the British Ordnance Office for the Military Hospital at the Government Domain which was built in 1841 and held twelve patients. It represents the domesticated element of this hard masculine place and was the last of the military buildings to be built at the Government Domain, having a shared use as a house and a hospital. This enabled a medical person to always be at hand. The hospital contained three wards, a surgery, store room and the small room at the front of building that was the Surgeon’s Quarters. The smaller building behind the main house was the kitchen containing two small rooms for the larder and a ‘Surgeon’s Closet’. On close examination of the plan the ‘Surgeon’s Closet’ is crossed out and labelled ‘Dead House’, or mortuary. Kitchens were commonly built separately from the main house because if fire broke out, it was more likely to be contained. Other architectural plans relating to the NGD show the design, as well as the layout of the spacious offices and rooms of the large rectangular barracks buildings. These plans are held at the Kew archives in the United Kingdom and are shown in Figures 3, 4, 5. The Imperial authorities announced in 1849 that the self-governing colonies would need to provide their own defence forces and that British forces would be reallocated. The colony was left with possessions that had strategic value, however they were unable to defend them themselves. Already well along the way to being granted responsible government in1855, NSW was one of the colonies from which imperial troops were gradually withdrawn. Each Australian colony was directed to establish or expand its volunteer forces. The rationale for a gradual withdrawal by British forces over a 15 year period was so that the colonial forces had time to build up and became a large enough volunteer defence force to be effective if they were needed to protect the colony. In 1862 the Mills Committee presented its findings to the British Parliament, recommending that the responsibility and cost of defence should rest solely with the colonial authorities. After another five years, all Imperial troops in Australia (except one regiment) would return to Britain, with all regiments having departed by 1870. The Imperial forces at Newcastle were withdrawn relatively quickly, in 1851, coinciding with the completion of Macquarie Pier. The 1860s were a decade of preparation in forming colonial volunteer regiments. To support the development of colonial defences, existing military barracks and the parade ground were handed over for the use of the colonial authorities. The vacated military barracks at the Domain were practically new when taken over by the colonial Government. The cost to the Imperial Government in constructing the military buildings at Newcastle was considerable. The responsibility was that of the Board of Ordnance which had initiated and overseen its construction. The British Ordnance Office ceased to have a presence at the site after 1851 when responsibility was handed over to the colonial government to provide its own defence forces. The Imperial government transferred to the Colony of NSW military barracks and buildings, and associated lands. Military infrastructure was handed over on the terms that responsibility for any future expense for upkeep and maintenance was with the colonial government. 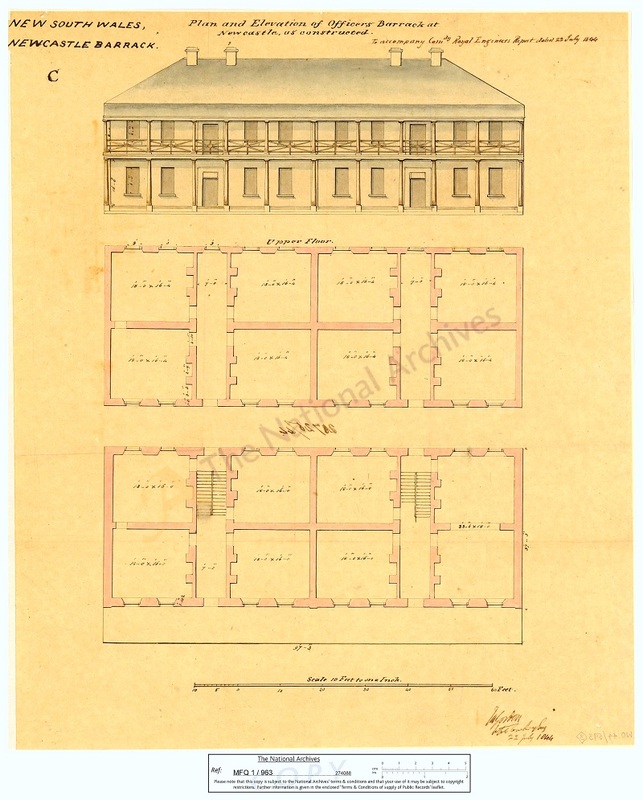 Although ownership arrangements changed in 1851 the Imperial government reserved the right to resume military land and buildings and called on the colonial government to preserve the buildings. They wanted the colonial government to be mindful to whom the buildings would be leased, because they were concerned that inappropriate tenants could occupy the ‘fine buildings’, possibly neglecting and damaging them. The Imperial government did not support the idea of putting the buildings out to public competition or tender. Instead it wanted the buildings properly cared for and maintained. Proposals for the buildings included their use as a candle factory, school, a fever hospital and a slaughter house. None of these were acceptable to the British Ordnance Office which preferred the buildings to be partially tenanted rather than fully occupied by an undesirable enterprise. They believed that an “empty house was better than a bad tenant”. Therefore the existing tenants were maintained rather than introducing new ones. This ensured a sympathetic use of the buildings and grounds. Although the British authorities had no physical presence at the Domain, it was heartening that they continued an involvement and responsibility in protecting these fine buildings by making genuine attempts to care for them during the 1850s. 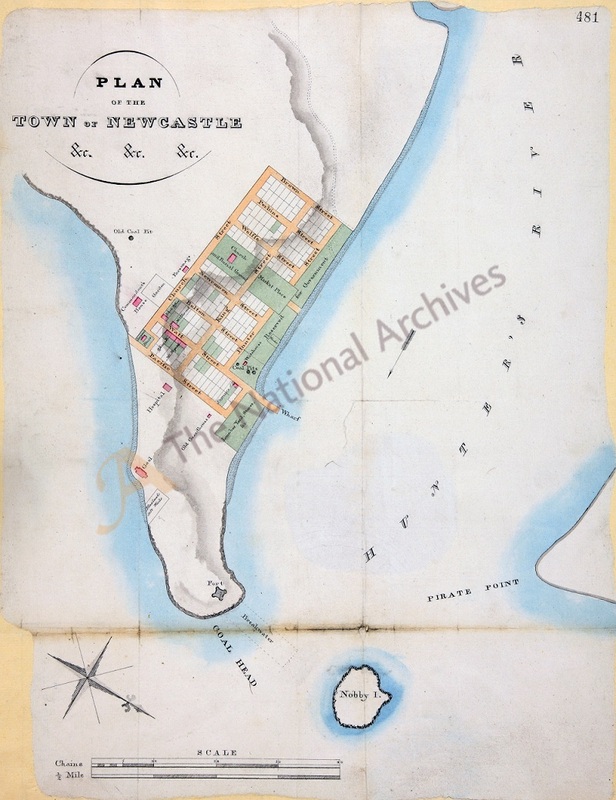 When the Imperial Forces left Newcastle in 1851, the colonial government had yet to establish its own regiment that could take over the military barracks at Newcastle. Therefore a community-based volunteer regiment was formed. A nominal rent of one shilling per annum was paid by the colonial authorities to use the Government Domain and in return they had to maintain the site. Volunteers used the site and some buildings, but other buildings were leased to tenants. Although there was initial enthusiasm for a volunteer regiment in NSW, this waned after the Crimean War (1853-56) as the sense of urgency to establish a colonial corps faded. Attempts to organise a force for the protection of the colony stalled and volunteers could not be recruited. During the later years of the 1850s the defence of the colony was again considered because of the Franco-Austrian War of 1859 had brought attention to the close location of New Caledonia that was occupied by the French. Although Britain eventually remained neutral in this war, it had brought about a renewed interest in the need for an effective defence force in the colony with popular demand for a voluntary force. By 1861 a permanent voluntary corps was formed consisting of three artillery batteries, a Rifle Regiment of two thousand men, named the 1st Regiment of NSW Rifle Volunteers and a NSW Naval Brigade with detachments in Sydney and then later in Newcastle. The public rallied to support the newly established volunteer forces with many suburbs, towns and cities establishing their own infantry. Local volunteer forces were formed at Newcastle and the purpose built barracks and parade ground were perfect as a place to meet and train. The Northern Battalion Volunteer Newcastle Rifles was established in Newcastle in 1855 under the command of Captain Baker. The type of person that became involved in the volunteer forces was varied, ranging from a leading physician, an industrialist and member of the colonial parliament, and several men involved in local government. A committee was established that included Dr Brooks, Captain Weatherill, Thomas Adam, AW Scott, C Bolton, GD Simpson, W Charlton and HT Plews. The same year a Volunteer Artillery Corps was also formed. It was instructed by Captain Macpherson Samuel Holt, who had been Chief Constable for Police in the Newcastle district since 1844. In February 1861 he became the First Lieutenant of the Battery. Retiring from the police force in 1862, he was promoted to Captain and Commanding Officer of the Battery in 1868. By January 1861 there were twenty-seven men in the Newcastle Unit many of whom had joined after a public parade of volunteers in Sydney that month. Figure 6 shows the men of the Naval Brigade facing east with the Church Street terrace houses visible in the background behind the pine trees. Figure 7 captures the visual drama of firing the field guns. These photographs were likely taken in the 1880s after the Newcastle Asylum had been established on the site as they contained buildings constructed in that decade. The volunteer infantry would meet there at six o’clock on a Thursday evening for drill followed by a recreational game of cricket. Cricket was thought to be a “desirable recreative employment for the mental and bodily energies of Young Australia” and very much part of their training. The Domain was perfect for cricket because of the expansive level field provided by the parade ground. The pitch is shown at the bottom of the image. The wicket was in a peculiar position next to the main entrance of the site where it was restricted by gardens on one side and the Guard House on the other. The end of the wicket was close to Watt Street, right next to the ‘pits’ that were annotated on the James Barnett’s 1880 “Plan of the Newcastle Hospital for the Insane”. This was probably referring to the Wallis Shaft (also known as Asylum Shaft). This was not an ideal place for a game of cricket, and the wicket was later moved to the centre of the Recreation Ground. The community also used the parade ground for purposes other than cricket during the 1850 and 60s. A visitor to Newcastle in the 1850s noted that pitmen, Aboriginal people and sailors congregated in the evenings on the public green west of Watt Street. This is likely to have been the former parade ground at the Government Domain. In the 1860s, this space was referred to as the Recreation Ground. There was no other large civic park or public area where events could take place during this time. From this decade, the local community displayed an increased confidence in advocating for public spaces and an interest developed to use the parade ground at the Government Domain for sporting, social and other community events. 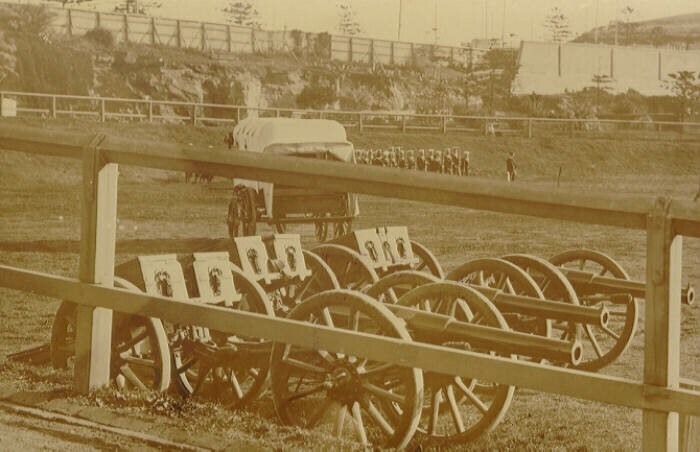 The Newcastle Artillery and Rifle Corps had a presence at local community events, such as the annual Anniversary Day regatta held on Newcastle Harbour on 29 January 1861, for which they assembled on the parade ground at the Government Domain. On this occasion they fired a salute from one of the guns that had recently arrived from Sydney and then the Naval Corps marched down the hill to watch the regatta. This public presence was designed to encourage recruits to the voluntary Corps. On other occasions there were grand displays held on the parade ground at the Domain where the community were welcome to come and watch. The Artillery and Naval Corps at this time were in the process of forming bands that later became a regular feature at the Government Domain which drew people to the place. 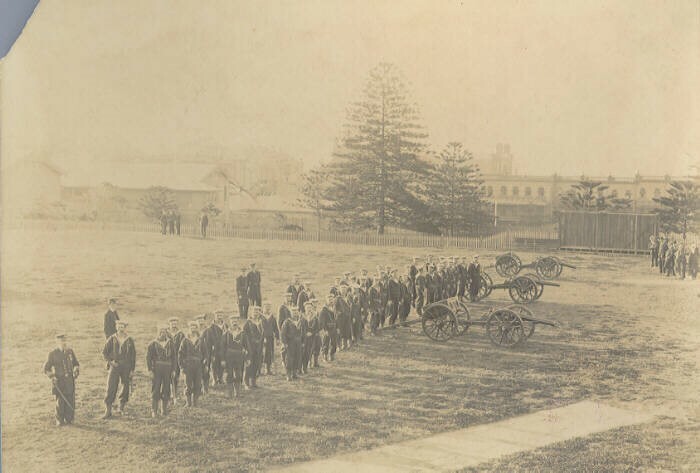 The Newcastle Naval Brigade that also trained at the Government Domain was established in 1865 under the command of Captain Allan, the local Harbour Master, and was later led by Mr Herbert Cross. 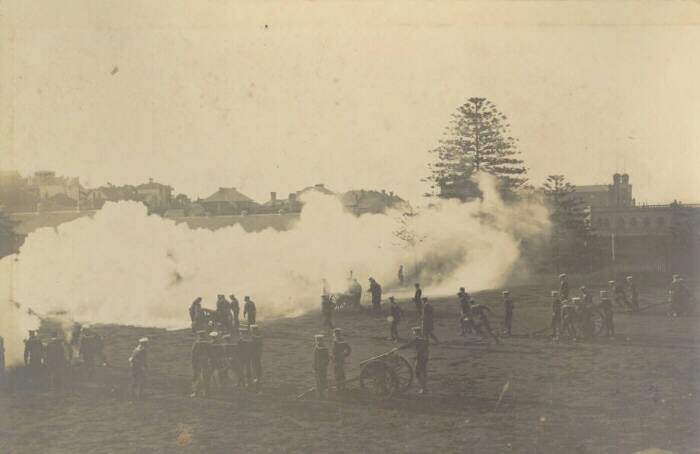 The volunteer units relocated to Fort Scratchley after it was constructed in 1882. This was considered a more suitable location as it overlooked the approaches to Newcastle Harbour, the pier and harbour. However the volunteer units took advantage of the open space at the Domain throughout the 1870s and 1880s for training and drill. Figure 8- “Naval Guns and Ambulance Parked at Watt Street (James Fletcher) Hospital Grounds”. Source: Hunter Photobank. Date unknown Newcastle: Hunter Photo Bank- 026 000187, 1860s). Figure 8 shows the Government Domain with naval guns, a volunteer ambulance and a volunteer unit lined up beneath Ordnance Street on the southern boundary of the site. The rough cut wall shows the amount of excavation which was necessary to make the area level for the construction of military buildings and parade ground. This high wall, topped with a solid fence, hid the site from the adjoining houses and streets beginning the social isolation of the site which was almost total by the twentieth century. 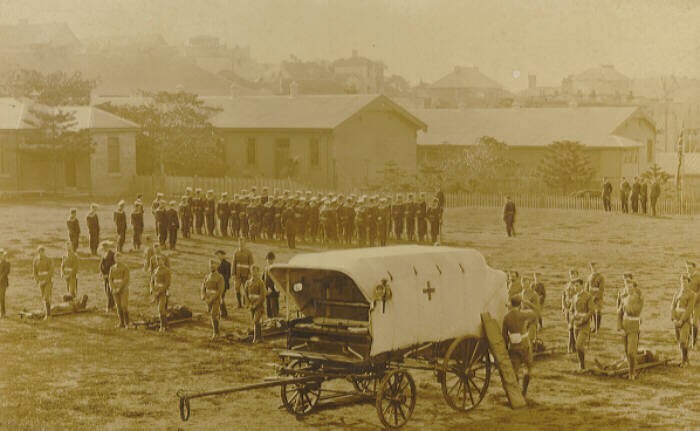 Figure 9 is a photograph of the Volunteer field ambulance that was formed around the same time as the other volunteer forces in the early 1860s. Figure 9 -“Naval Guns and Ambulance Parked at Watt Street (James Fletcher) Hospital Grounds”. Source: Hunter Photobank. Date unknown. The voluntary regiments and brigades not only used the outdoor spaces at the Domain but rented offices in the former military buildings during their time there. The buildings were also leased to various Government departments and organisations between 1851 and 1867 as the complex was large enough to accommodate numerous groups. Most of these offices were associated with government agencies, with the exception of the AA Company. The Domain was thus shared and continued at this time as a place of authority. In 1851 the Officer’s Quarters were occupied by Captain Bull and Dr J.E. Stacey the Colonial Surgeon, as well as Mortimer Lewis (Jnr), the Clerk of Works. Dr Stacey had a long association with mining and medicine practices and had worked in the 1830s dispensing medicine for the AA Company; later working as Colonial Surgeon in the 1850s and 1860s. The role of Colonial Surgeon included the duties of a Government Medical Officer who cared for troops, police and the general sanitation of the town. He lived at the Domain, a location central to government employees and their families at Newcastle. 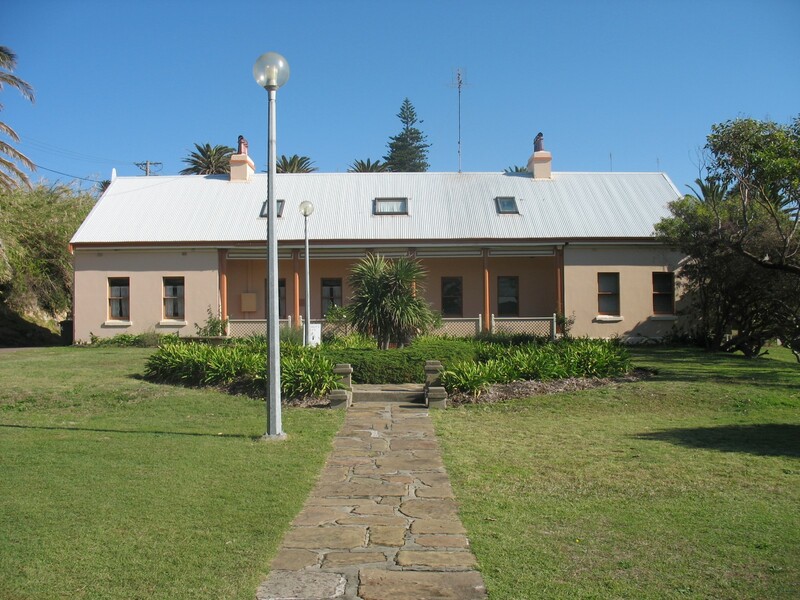 In 1853 the Guard House was used as the Chief Constable’s residence and the Police Barracks were transferred to the former military hospital, also the base for the local Police Magistrate. The AA Company rented rooms in 1855 and the Inspector General of Police used the Guard House situated at the entrance of the site. The Engine House next to the Guard House was used as a police station. Mr William Keene the Examiner of the Coalfields and Mr J Dagwell the drill instructor of the Naval Brigade had offices in the military buildings in the 1850s. The Immigration Office had a ‘depot’ there, as did the Volunteer Rifles. The buildings at the Domain were well used and occupied by mainly government agencies. 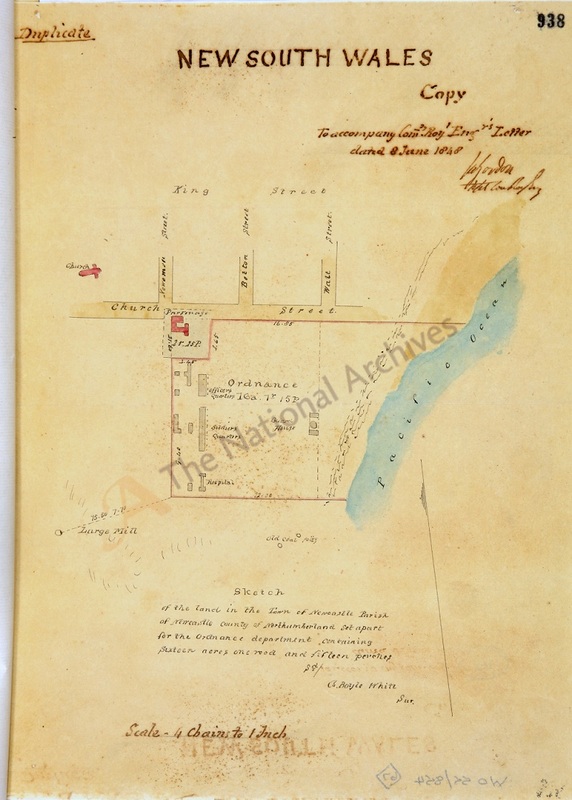 Between the years 1841 and 1867 the Newcastle Government Domain remained exclusively in government use and as a place in defense of the community. And in that guise, significant investment was made which left the colonial government with a significant assett in terms of the buildings which could be redeployed in other official roles in the future. The people of Newcastle valued this central open space and assumed that it would continue in that role, becoming a botanic garden or other public facility. However the colonial government floated the idea in 1866 that a lunatic asylum be situated at the site. There was much opposition to this, even from religious and medical men who might have been expected to understand the need for such a facility. Although importance of the military has declined, military sites such as the one at Newcastle are relics of the British Army’s presence in Australia. British forces were only there for a short time, however the military infrastructure set up at Newcastle were used exclusively by Government into the future. Today the Domain is both a heritage and health site, an historic site with a varied and mixed past. Thanks so much for posting Ann. It is a very important site. We are so lucky that it has survived!